HERALD PHOTO/Rich Muller Norton firefighters open up the east wall of Grace Church searching for remnants of the fire which damaged the church’s upper auditorium. From the Barberton (OH) Herald. To read the original article and see additional photos, click here. Multiple fire departments were called on to assist Norton firefighters in battling a fire in the upper auditorium of Grace Church on Cleveland-Massillon Road. The first call went out Tuesday at 10:22 a.m.
Norton Fire Chief Mike Schultz said the first units were on scene within two minutes and found heavy smoke coming from the east face of the building. 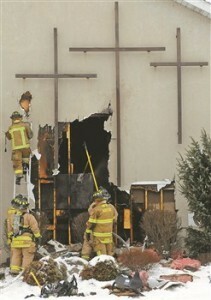 They were able to quickly knock down the fire, limiting damage to that part of the church. The cause of the fire is being investigated. The auditorium suffered mostly smoke and water damage. The rest of the church was not damaged and remains open for services. Among the fire departments assisting Norton were Barberton, Akron, Copley, Clinton, New Franklin, Fairlawn and Chippewa.